You'll be able to get your hands on the Wavedrum in December. PRESS RELEASE: The original WAVEDRUM percussion synthesizer released in 1994 is one of KORG's legendary musical instruments famous for its innovative design, performance possibilities and unique sounds. Now the affordable next generation WAVEDRUM is here - sonically richer, more sensitive, more powerful and expressive enough to create its own musical legend. With its wide dynamic range equivalent to that of an acoustic instrument, the WAVEDRUM responds perfectly to the performer's action, from subtly nuanced touching and stroking to aggressive hitting. It has a wide variety of instruments ranging from standard acoustic percussion instruments to new and unique percussion sounds. Instruments that normally require special techniques to play, such as tabla, conga, etc., can be played easily. In addition Wavedrum establishes its own way of playing giving you unparalleled expression full of originality and depth. And with its compact and light weight design, the WAVEDRUM fits all performance situations from casual playing through to full on recording or performance. Totally unique sounds and new ways to play will take you to a world of unprecedented sounds. The WAVEDRUM helps inquiring creative performers who seek new expressiveness and sounds. Besides ordinary percussion sounds, the WAVEDRUM contains totally new and unique sounds that are not available in real world and offers new ways of playing for new musical expression. Changing the pitch randomly with each hit, or play melodic phrases by setting a musical scale and applying pressure to the head, a performance characteristic unique to the WAVEDRUM. You can get new previously impossible sound variations such as controlling the pitch or tone of the release part of a sound by pressing the head after playing it by hand or mallet. You can sustain sounds just by pressing the head. So, for example, the WAVEDRUM can produce sitar and tanpura sounds at the same time. - You can produce tanpura sounds only by hitting the head, and add sitar sounds by applying pressure and then hitting the head. Applying further pressure can change the pitch of the sitar continuously within the selected scale. Thus, you can express yourself by playing new sounds with new ways of playing available only with the WAVEDRUM. Attains previously unimaginable expressiveness through innovative synthesis technology. A percussion instrument that produces dynamic sounds by strokes of the hand is a very naturally "physical" instrument. The WAVEDRUM, although an electronic musical instrument, sticks to this physical concept. The head and rim pickups are directly used as a sound source to be processed by the DSP (Digital Signal Processor) algorithms and trigger the PCM sound engine. 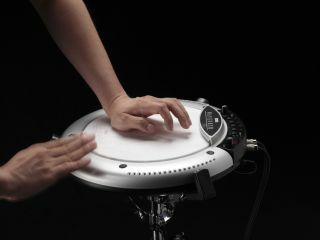 Together with the pressure sensor under the head, the WAVEDRUM responds to subtle motions of fingers and hands such as hitting, rubbing, scratching etc. as well as to traditional hand playing techniques such as open shot, slap shot, heel and toe, mute, etc. Of course, the WAVEDRUM also responds to different playing materials such as sticks, mallets, brushes, etc., as well as the playing position of the head to play with the expression and dynamic range that are almost equivalent to that of acoustic drums and percussion. The rim has two types of notches, small and large, and these can be used to get a tremolo type effect by scratching with sticks, etc. Combine the rim sounds with head sounds for an even richer, more original performance. 36 DSP technology algorithms and 200 PCM instruments. The WAVEDRUM contains 36 software based algorithms that use DSP technology to realize a variety of synthesis methods such as analog, additive, non-linear, physical modeling, etc. Working with these algorithms, you can create various instrument sounds, natural sounds, etc. in addition to WAVEDRUM's own unique sounds. The PCM sound engine, the other important part of Wavedrum's sound creating system, contains 200 PCM sounds - 100 for the head and 100 for the rim. Combining the PCM sounds with the algorithms delivers a natural response which is not possible with ordinary PCM only sound systems. The Wavedrum uses Single Size Algorithms and Double Size Algorithms. Single Size Algorithms allow you to freely assign a different algorithm and PCM instrument to the head and the rim giving you a broad array of sounds. Double Size Algorithms allow you to control the PCM sound source (the PCM instrument) not only by velocity (striking force) as on a traditional PCM sound module, but also by the tone of your strike on the head. Since the force and tone of your strike affect the sound, you'll be able to perform with a feeling close to that of an acoustic instrument. Contains ordinary percussion/drum sounds, and rare ethnic percussion instruments from around the world. Ethnic percussion instruments, although seemingly simple in structure and performance are capable of expressing the emotions of a culture. The WAVEDRUM contains various percussion sounds from many eras and cultures. Besides ordinary drum sounds such as snares, tom toms, etc., the Wavedrum includes popular percussion instruments such as cajons, congas, tables, etc., metal percussions such as cowbells, triangles, and also rare ethnic percussion sounds. With the WAVEDRUM, you can instantly play the udo, a clay pod percussion, the jegog, bamboo marimba from the island of Bali, a talking drum from Africa, gongs, and other instruments that requires special techniques to play well. There are other plucked instruments such as sitar, koto, berimbau as well. For every sound, the WAVEDRUM delivers its own new expression in addition to correctly imitating the original sounds. 100 preset programs covering a variety of playing and musical genres. The WAVEDRUM contains 100 preset programs ranging from ordinary emulative drum and percussion sounds to a world of and new and unique sounds depending upon the way you play. There are a range of parameters available for editing sounds (based on the preset programs) to suit your own music or style of playing. In addition to making changes to pitch, decay time, loudness, reverb, delay, and curve (intensity) of the pressure sensor, etc., you can completely alter the sound by, for example, changing the head from skin to metal. The combination of algorithm and PCM sounds can also be changed to create totally new sounds from scratch. These new programs (up to 100) can be stored in the user area. The WAVEDRUM also has a Live Mode which can store up to 12 favourite programs (from preset or user programs) for selecting programs instantaneously during stage performance. Jam along function for added fun. You can enjoy the WAVEDRUM just by playing the sounds alone, or you can use the jam function of the WAVEDRUM to experience the fun of a jam session. The WAVEDRUM contains 100 loop phrases from various musical genres and tempos. Also, there is an AUX input so you can mix the Wavedrum with an external audio source such another Wavedrum, a CD/MP3 player or other audio source. Dynamic Percussion Synthesizer providing new/unparalleled expressiveness through innovative synthesis technology. Versatile and flexible performance from a hybrid sound generation system combining DSP based synthesis algorithms and PCM playback engine. Unprecedented expression by creating unique sounds using the pressure sensor and piezoelectric pickup and translating subtle nuances of how the head and rim are played. Individual playing styles will produce different sounds depending upon how the head and rim are played, how pressure is applied pressure to the head, etc. 100 preset programs covering a wide range of sounds from standard percussion sounds to new and unique sounds. 100 user programs for storing your own sounds. Live mode can store up to 12 (4 programs x 3 banks) favourite sounds for instant recall during Live Performance. Compact and light weight design allows for easy transport and set up. 100 loop phrases covering various genres and tempos allow Wavedrum users to jam along. AUX input allows monitoring of another WAVEDRUM, CD/MP3 player or any other audio source.